The Galician Ramón Silvestre Verea Aguiar y García was born on 11 December, 1833, in the farm of his family in the small rural community of Esmorís, parish San Miguel de Curantes, Pontevedra, to Juan Verea Filloy (a son of Pedro Verea and María Filloy from Esmorís) and Florentina García de Porto (a daughter of Jose Garcia and Feliciana de Porto, from Freán, parish of Santa Cristina de Vinseiro, Pontevedra). 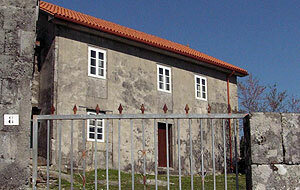 The humble house, where Ramón was born, is still preserved (slightly renewed) in Esmoris (see the photo below). As a boy Ramón attended the primary school in Curantes, and was tutored by his uncle, the priest Francisco de Porto, an educated man and owner of a big library. In 1846, at age of thirteen, Ramón left his home to enter the Faculty of Philosophy and Letters of the University of Santiago de Compostela. 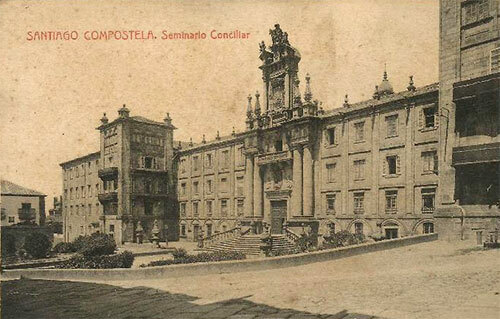 In 1848, following the wish of his uncle for a priestly career, he entered the Seminario Conciliar in Santiago de Compostela (see the lower image). Verea stayed in the seminary for six years (until 1854) and appears immediately as a great student, achieving remarkable results in philosophy, metaphysics, Hebrew, etc. His summer holidays he devoted to his passion for reading, and organized an impromptu workshop on the porch of his house, in order to master different gadgets. However, Verea's curious mind always tried to investigate the reason behind everything, thus his numerous questions could not get the appropriate answers from his religious teachers. In some moment his faith was hesitated, and he realized that he is not going to devote his life to the religion. In 1855 Verea shipped to Cuba, to begin his real life adventure. There he started as a school master and teacher in Sagua la Grande, a small city near Colón, and then in Colón, where he wrote two novels and writes as a journalist for newspapers like El Progreso. He also studied English, planning his relocation to USA. There was a description of Verea from 1862 from his friend, the journalist and writer José Manuel Pérez Moris: "...a young 28 years old, tall, tanned, slim waist and wide chest, facing clear, large eyes, alive and intelligent, happy character, determined, restless and frank... ". Already in his student years Verea was interested in making simple devices that could have a useful application. In 1863, during his stay in Colón, Cuba, he devised a machine for folding newspapers. Later, when he already lived in US, as he hadn't sufficient financial resources to build and patent the apparatus, he sold his invention to a speculator in New York. In 1865, looking for better luck, Verea moved for short time to Puerto Rico, then to New York, USA. There he started as a journalist in a biweekly Spanish-language newspaper, and a teacher and translator in Spanish. At the same time, Verea kept his interest in inventions and in machinery, and in 1867 he returned to the city of Havana, where he tried to establish himself as a representative to introduce machinery and appliances of modern invention in Cuba. The project, despite not reaching the benefits Verea expected, helped him to save some money and to obtain a good experience. After spending almost eight years in Havana, Verea returned to New York with a small capital and in 1875 established an Industrial Agency for the Purchase of Machinery and Effects of Modern Invention. It seems he remained keen of journalism all the time and in 1877 he became a director of the newspaper El Cronista. Hearing the complains of his Spanish friends and insinuations of his American friends, that the Spanish have fallen behind in the historical process of scientific and technical progress, that the Spanish had no capacity to adapt, that his time had passed, he decided to prove the opposite, creating a very interesting direct-multiplying calculating machine (see the calculating machine of Ramón Verea). in 1879 Verea returned for some time to his home country. In his village in Curantes he found everything remains the same, no progress since his childhood and his parents are already dead. He visited Santiago and Coruña and returned to the USA in 1881. Back in the city of New York, in 1882 he sets up a modern printing press named "The polyglottis". In January 1884, he founded a monthly illustrated magazine, El Progreso, which was printed on his press. 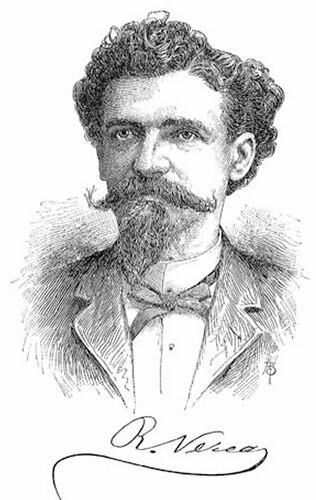 In February 1895, displeased at his life in New York and the US policy of intervention in Cuba and Philippines, Verea moved to Guatemala. There he was warmly welcomed by the President Reina Barros, and wrote several books, "La defensa de España", "La cuestión de Cuba", etc. However, Verea was soon disappointed by the policy of the president and was again searching for better place. In 1897, Ramon Verea, single and lonely, moved to Buenos Aires, Argentina, in the hope to meet several Galician intellectuals and some relatives who lived there. In that city he founded the biweekly journal El Progreso (Jan. 1898), and continued to publish and act as a journalist. Ramón Verea spent all his life as an idealist and liberal. He preached for equality between men and women, the abolition of slavery, and freedom of expression. He wanted to defend reason against fanaticism; to defend the Chinese, the blacks, the Indians and all the oppressed who could give me nothing, against the oppressors who are strong and powerful and from whom gold and favour can be obtained. This beautiful mind—Ramón Silvestre Verea Aguiar y García, died leaving no issue, poor and lonely, from an infection of lungs in the capital of Argentina on 6 February, 1899, and was buried in an anonymous grave in Cementerio del Oeste, Buenos Aires.